At ConfiDenT, we pursue the latest treatments in modern dentistry. When it comes to replacing a full arch of missing teeth, the All-on-4 dental implant system ranks superior to other denture designs. All-on-4 dental implants address the common drawbacks that traditional dentures often produce. Since removable dentures rest on the gums with adhesive, they often slip out of place or need frequent adjustments to stay comfortably in place. The All-on-4 treatment concept permanently solves the disruptions of ill-fitting dentures. For many reasons, All-on-4 implants are considered one of the most innovative options in implant dentistry. They offer all the benefits of an overdenture with a faster and less invasive treatment process. Using as few as four dental implants, our dentists can secure an entire arch of prosthetic teeth (full dentures). Patients gain a more natural feel and greater stability with their dentures. Not only can you eat, speak and laugh with confidence, but you can avoid the inconvenience of using adhesive creams or restricting your diet to softer foods. The All-on-4 implant system takes overdentures to new and improved level! The All-on-4 implant technology utilizes advanced dental imaging and sophisticated computer software to produce a highly successful implant denture in as little time as possible. Compared to a traditional dental implant, the All-on-4 model involves a unique design and angled placement of the implant, which means that the procedure is less invasive and less jawbone structure is needed to support the implant. This makes All-of-4 implant dentures an ideal solution for patients who have experienced bone loss or for those that want an immediate smile restoration after missing teeth. In fact, the All-on-4 system allows our dentists to provide your dentures in just one day. If you want to avoid bone grafting and experience less recovery time after implant surgery, consider the revolutionary option of All-on-4 implant dentures. When it comes to restoring your smile after missing teeth, our dentists take extra measures to ensure your experience with us is exceptional. We want you to feel informed about your treatment choice and rewarded with your smile results. 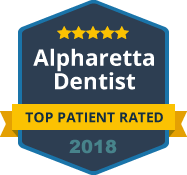 To learn if you are a candidate for All-on-4 implant dentures, contact our Alpharetta office today.